Actually, you may have to be a lunatic to go out and observe this event on Sunday night as it’ll just be brutally cold throughout the Mid-Atlantic region. However, if you are so inclined, there will be a total lunar eclipse and supermoon, all wrapped up into one. The moon, earth and sun will line up late this weekend for the only total lunar eclipse of this year and next. At the same time, the moon will be ever so closer to Earth and appear slightly bigger and brighter than usual – a supermoon. It shouldn’t bee too hard to find, but here is where the moon will be on Sunday night. On Sunday, January 20 and Monday, January 21, the moon will be full for the first time this year and it will be the first of three straight supermoons. Not only will the moon appear slightly bigger and brighter this weekend, but there will be a total lunar eclipse visible in North America on Sunday night and this particular total lunar eclipse will last pretty long…about an hour. The whole eclipse starts in the eastern US at 10:34 PM and ends after midnight early Monday morning (see below for more details). At 10:34 p.m., the Earth’s shadow will begin to nip at the moon. Totality — when Earth’s shadow completely blankets the moon — will last 62 minutes, beginning at 11:41 p.m. Sunday. If the skies are clear, the entire eclipse will be visible in North and South America, as well as Greenland, Iceland, Ireland, Great Britain, Norway, Sweden, Portugal and the French and Spanish coasts. 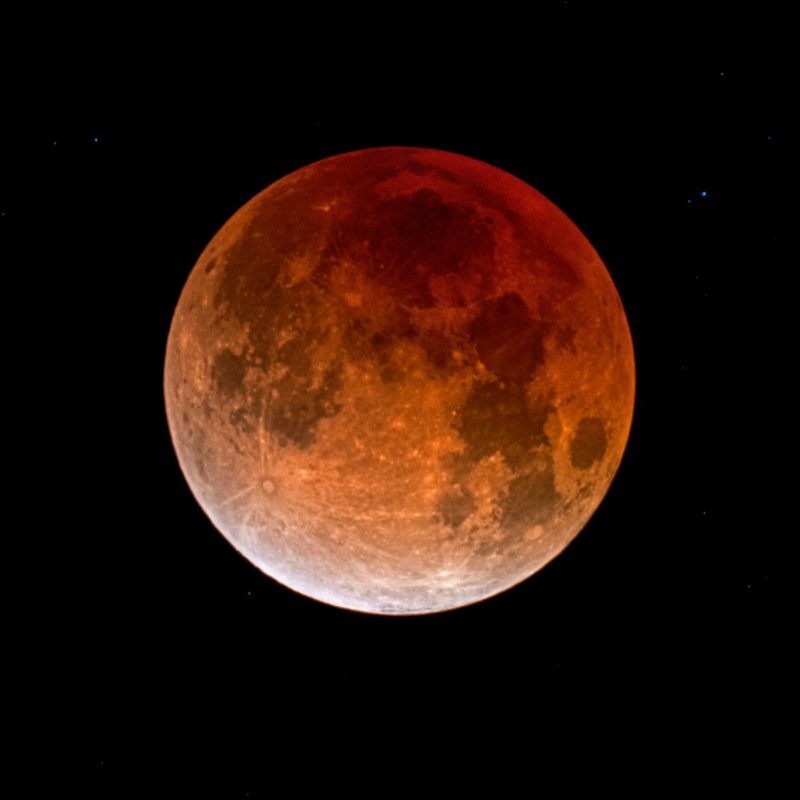 During totality, the moon will look red because of sunlight scattering off Earth’s atmosphere which is why an eclipsed moon is sometimes known as a blood moon. In January, the full moon is also sometimes known as the wolf moon or great spirit moon. The upcoming supermoon will be about 222,000 miles (357,300 kilometers) away. The Feb. 19 supermoon will be a bit closer and one in March will be the farthest. The next total lunar eclipse won’t come until May 26, 2021. As far as the weather is concerned, an Arctic blast will arrive in the Northeast US late Sunday following a significant winter storm. Skies may very well turn out to be partly cloudy by late Sunday evening – somewhat favorable prospects for viewing – but it’ll be brutally cold and the winds will be strong out of the N-NW. Bring a blanket and some hot chocolate.